Context: Sound pollution is a common problem in intensive care units (ICUs) with unfavorable consequences. Aims: The aim of the current study was to determine the effect of staff training on the amount of sound pollution in the ICU. Setting and Design: This quasi-experimental study was conducted in the ICU of Rouhani Hospital in Babol. Materials and Methods: Level of equivalent (leq) sound was measured in three work shifts for 2 weeks, before and after training, in 2 workdays and a holiday, using a systematic network stationing method. The sample size was determined based on the days of measurement, work-shift, and measuring stations (6 × 3 × 10 = 180). Indirect training was performed. A 2-week opportunity was given to study materials. Statistical Analysis Used: Data were analyzed using paired t-test and RMANOVA. Results: Following the training, the mean leq in all stations (ten stations) decreased from 67.21 to 62.11 dB (P = 0.002). Conclusion: Although the amount of sound pollution decreased significantly after training, it was still higher than standard. To achieve the desired level of sound, continuous monitoring of sound at intervals of 6 months, along with structural engineering and equipment, is suggested. Patients admitted to the intensive care unit (ICU) are at risk from unpleasant experiences due to several factors, including pain, sleep disturbances, painful medical interventions, and sounds in the ward. An undesirable and annoying sound is a mental concept influenced by cultural and social factors and individual and attitudinal characteristics. Many hospital staff believe that high and permanent sounds such as ventilator physiologically and psychologically have adverse effects on the health of patients. These negative effects include increased blood pressure, ischemic heart disease, pain management disorders, increased duration of hospitalization, and delayed wound healing., On the other hand, >30% of patients admitted to ICUs have attention-deficit disorder and dizziness due to increased voice and sleep disturbance so that the need for sedation and invasive methods in these patients increases. Excessive sound (over 50 dB) can also increase the acid secretion of the stomach and impair the ability of the body to deal with infections. Voice above the permissible threshold, in addition to the deterioration of the patient, can have negative effects on the staff and leads to increase in heart rate, tension, stimulation, and distress of nurses. Increasing the stress of employees when providing care services increases the incidence of medical errors. To take into account the exposure time of individuals with different sound levels, weighted average time variations of sound are considered, that is called the level of equivalent (leq) sound. The World Health Organization has stated that the level of sound within hospitals is <35 dB at day and 30 dB at night. The findings of a study showed that nursing and medical staffs produce 30%–60% of the sounds in the hospital. However, 34% of the sources of sound production are completely avoidable and 28% are somewhat avoidable. There are various strategies for dealing with sound pollution, such as changing the design of building engineering based on sound reflection and changing equipment design and training staff. Employee training seems to be the easiest and least costly one. Learning simple ways such as closing doors and quiet talking can help reduce sound levels. Various studies have shown the effectiveness of training staff in the ICU on the degree of sound pollution., However, in one study, this effect has not been observed. In our country, in several descriptive studies, the status of sound pollution in special sectors has been studied and in all of them, they were above the standard.,,, Only one study investigated the effect of peer training on sound pollution management on neonatal ICU with physicians and nurses as its audiences. The aim of the current study was to determine the effect of staff training on the amount of sound pollution in adult ICU and its audience was all staff including physicians, nurses, assistants, secretaries, and ward workers. This is a quasi-experimental study conducted in the ICU of Rouhani Hospital in Babol in 2016 (with IRCT code 2016052728101N1). First, leq sound was measured in three work shifts in the morning (8–12), in the evening (16–20), and at night (20–24), for 2 weeks, before and after training, in 2 workdays and a holiday, respectively, Saturday, Tuesday, and Friday, using a systematic network stationing method by Sound Level Meter, Model Cel440 Made of UK. Before the above measurements, calibration of the acoustic calibrator was carried out under expert supervision. The noise pollution was determined using a regular network stationing method, and measuring the A (human hearing range). Thus, the area of 250 m2 was divided into 5 m × 5 m and the center of this square was marked and considered as a sound recording station. In this way, 10 stations were recorded for sound level and the equivalent level of sound was recorded in the checklist. Since sound measurements at each station were performed for half an hour, an additional hour was added to the time intervals (morning 7:30–12:30; evening 16–21; night 21–2). The sample size or frequency of measurement was determined 180 times (6 × 3 × 10 = 180) based on the measured days (6 days), work shift (3 times), and measurement stations (10 stations). The personnel sampling method was census. The staff included three physicians, 30 nurses, seven assistants, one secretary, and three ward employees, a total of 44 people. The purpose of study was explained to the staff and told them that they can be excluded, whenever they want. All participants were assured that the information obtained will remain confidential; and the oral and written informed consent was obtained from them. Following initial measurements, noise pollution outcomes and its reduction methods were indirectly trained the staff, through the provision of educational pamphlets, installing a CD in the ward computer and putting up posters at the entrance to the ward and a 2-week opportunity was given to study the materials. The educational package was provided by referring to specialized books and articles. Its content includes physical and psychological complications of long and prolonged noises on patients and nurses, voice sources in the ICU, and voice reduction solutions. The validity of the content was approved by five members of the scientific community. The reason for choosing an unconventional method was that according to some previous studies, there was no significant difference between the effectiveness of the two methods of in-person training and nonattendance (educational package), or even in some cases, the nonface-to-face approach was more effective.,, Immediately, after the training (after 2 weeks), leq sound was re-evaluated. Since this training was not carried out by the hospital authorities, there was no reason for fear or lack of job security. Training materials for most of the staff were observed personally by the researcher. In a small number that was not personally observed, verbal questionnaire was assured. This study was approved by the Ethics Committee of Mazandaran University of Medical Sciences with code IR.MAZUMS.REC.95.2130. Data were analyzed using IBM SPSS software version 21.0 (Released 2012. IBM Corp, Armonk, NY), descriptive statistics (mean, standard deviation), and inferential statistics (paired t-test, RMANOVA). The factors that may have contributed to the degree of noise pollution before and after training (confounding variables) were recorded in the checklist [Table 1]. [Table 1] shows that there was no significant difference between the confounding variables before and after the intervention. 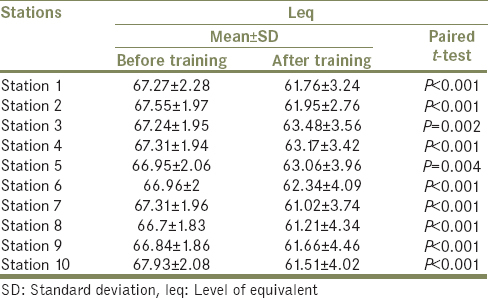 Paired t-test showed that at each station, leq sound after training significantly decreased [Table 2]. The average leq of the total stations (10 stations) also decreased significantly after training (62.11) than before training (67.21) (P = 0.002). RMANOVA test showed that there was no significant correlation between the level of sound pollution in different measurement days before training (P = 0.423). However, this relationship was meaningful after intervention (P = 0.02) so that the sound level on Tuesday (64.44 ± 1.01) was significantly higher than the rest of the day (Saturday, 58.94 ± 3.12 and Friday, 62.97 ± 2.83) (P = 0.005). Furthermore, RMANOVA test showed that there was no significant relationship between sound pollution and work shift before and after intervention. In this study, after training the staff, sound pollution was significantly reduced. However, still, it does not meet standards. The vast majority of studies conducted in our country are descriptive, and in all of them, the volume of sound in the ICU and other wards of the hospital is higher than the standard in a range of 57–68.68 dB.,, Only one interventional study was conducted in the Isfahan neonatal ICU where the level of sound was reached from 86.7 to 74.9 dB. In the above study, sound pollution was significantly higher than other studies. The findings of the current study, regarding to the effectiveness of training to employees on reducing the amount of sound pollution, are consistent with the results of study by Connor and Ortiz and Ramesh et al., In the Ramesh et al. 's study, intervention included staff training, associated with low-costs environmental changes. In the Connor and Ortiz's study, the average sound changed from 65 dB before training to 61.3 dB after training. The results of this study are contrast with the Milette's study, conducted in the pediatric care unit. In her study, the average sound changed from 15.58 dB before training to 58.46 dB after training (P = 0.118). On the other hand, the rate of sound pollution increased significantly after training, compared with pretraining. The researchers cited it as higher number of patients and nurses in the posttraining phase than before the training. According to the findings of this study, there was no significant difference between sound pollution at different work shifts (morning, evening, and night), this finding is consistent with the Hokmabadi et al., in Bojnurd, and Zonouzi in Tehran, whereas inconsistent to the studies by Jafari et al. and Asgharnia et al., The Jafari et al. 's results show the mean equivalent sound level at the evening shift was significantly higher than in the morning, but in the study of Asgharnia et al., it was more in the morning. This inconsistency could be related to performing the current study in the ICU of cardiac surgery and the absence of attendants and companions. However, in the study of Jafari et al. and Asgharnia et al., sound measurement was performed in all wards of the hospital and caused the increase in sound by crowds of patients, visitors, and companions mentioned. The results showed that there is a significant difference between sound pollution in different days of the week (Saturday, Tuesday, and Friday). This finding is consistent with the Abbasi et al. 's study in Isfahan and Asgharnia et al. in Babol and is contrast with the Hokmabadi et al. in Bojnourd. In Abbasi's study, the level of leq during the week was more than the end of the week, and in the study of Asgharnia et al., it was higher in work days than that of holidays. The fact that most selected surgeries in the ward are performed on Saturdays and Sundays, and the time taken to remove the patient's tube trachea is usually 2 days after surgery is one of the reasons for increasing the leq on Tuesday than that of on Saturday and Friday. The results of the current study indicate the level of sound in the ICU is higher than standards and needs special attention. Therefore, continuous training of employees, the adoption of technical engineering measures for the equipment and the structure of the hospital, and the elimination of the deficiency of the sound producer equipment seems necessary. Finally, to assess the effectiveness of these measures, continuous monitoring of sound at intervals of 6 months to 1 year is one of the recommendations of this study. KZ designed the study, advised on the analysis and drafted the manuscript. HA A, JY and ZT advised on the study design, helped to analyse and interpreted the data. All authors read and approved the version submitted. This study was supported by Research and Technology Deputy of Mazandaran University Medical Sciences, Sari, Iran. This study was supported by the Mazandaran University Medical Sciences, Sari, Iran, with ethical code IR.MAZUMS.REC.95.2130. The authors are thankful to dear staff of Intensive Care Unit of Rouhani Hospital in Babol for their cooperation. Abbasi S, Soltani F, Hoseinali Y, Evaluating the sound level and sources in Isfahan university hospital's Intensive Care Units. J Isfahan Med Sch 2011;28:1267-74. Sellappan E, Janakiraman K. Environmental sound from construction site power systems and its mitigation. Sound Vib Worldw 2014;45:14-20. Connor A, Ortiz E. Staff solutions for noise reduction in the workplace. Perm J 2009;13:23-7. Konkani A, Oakley B. Noise in hospital Intensive Care Units – A critical review of a critical topic. J Crit Care 2012;27:522.e1-9. Hsu T, Ryherd E, Waye KP, Ackerman J. Sound pollution in hospitals: Impact on patients. J Clin Outcomes Manag 2012;19:301-9. Darbyshire JL, Young JD. An investigation of sound levels on Intensive Care Units with reference to the WHO guidelines. Crit Care 2013;17:R187. Boehm H, Morast S. Quiet time: A daily period without distractions benefits both patients and nurses. Am J Nurs 2009;109:29-32. Kol E, Demircan A, Erdoğan A, Gencer Z, Erengin H. The effectiveness of measures aimed at noise reduction in an Intensive Care Unit. Workplace Health Saf 2015;63:539-45. Zolfaghari M, Farokhnezhad P, Asadi A, Ajrikhameslou M. Modification of environmental factor on quality of sleep among patients admitted to CCU. Hayat 2013;18:61-8. Milette I. Decreasing noise level in our NICU: The impact of a noise awareness educational program. Adv Neonatal Care 2010;10:343-51. McLaren E, Maxwell-Armstrong C. Noise pollution on an acute surgical ward. Ann R Coll Surg Engl 2008;90:136-9. Duarte ST, Matos M, Tozo TC, Toso LC, Tomiasi AA, Duarte PA, et al. Practicing silence: Educational intervention for reducing noise in the Intensive Care Unit. Rev Bras Enferm 2012;65:285-90. Zamberlan-Amorim NE, Fujinaga CI, Hass VJ, Fonseca LM, Fortuna CM, Scochi CG, et al. Impact of a participatory program to reduce noise in a neonatal unit. Rev Lat Am Enfermagem 2012;20:109-16. Asgharnia HA, Tirgar A, Amouei AI, Fallah H, Khafri S, Mohammadi AA. Sound pollution in the teaching hospitals of Babol (Iran) in 2012. J Babol Univ Med Sci 2014;16:64-9. Khademi G, Roudi M, Shah Farhat A, Shahabian M. Noise pollution in Intensive Care Units and emergency wards. Iran J Otorhinolaryngol 2011;23:141-8. Biabanakigoortani A, Namnabati M, Abdeyazdan Z, Badii Z. Effect of peer education on the noise management in Iranian neonatal Intensive Care Unit. Iran J Nurs Midwifery Res 2016;21:317-21. Jafari N, Bina B, Mortezaie S, Ebrahimi A, Abdolahnejad A. The assessment of sound polution in the wards of Feyz hospital and its around. J Health Sci Res 2012;8:377-84. Hekmatpou D, Zohoor A. A comparison betweenthe effectiveness of pacemaker care education through compact disc and group education on nurses' knowledge and performance in educational hospitals of Arak University of Medical Sciences in 2012. Mod Care J 2013;10:10-8. Baraz S, Mohammadi I, Boroumand B. A comparative study on the effect of two methods of self-care education (direct and indirect) on quality of life and physical problems of hemodialysis patients. Arak Univ Med Sci J 2006;9:1-16. Khakbazan Z, Jamshidi F, Mehran A, Damghanian M. Effects of lecture presentation and presenting educational packages on girls' knowledge about adolescence health. Hayat 2008;14:41-8. Ramesh A, Suman Rao PN, Sandeep G, Nagapoornima M, Srilakshmi V, Dominic M, et al. Efficacy of a low cost protocol in reducing noise levels in the neonatal Intensive Care Unit. Indian J Pediatr 2009;76:475-8. Hokmabadi HF, Fallah H, Takhsha N. Evaluation of sound pollution in Intensive Care Units and emergency in hospitals of North Khorasan University of Medical Sciences. J North Khorasan Univ Med Sci 2013;5:331-7. Zonouzi F, Ranjbarian M, Afjeie S. Evaluation of sounds in neonatal Intensive Care Unit in Mofid children's hospital. Med Sci J Islam Azad Univ Tehran Branch 2006;16:129-34.